In May, I did a presentation for the Southern Saratoga Artists’ Society. Many thanks to the SSAS for inviting me to present. The watercolor demonstration I did was the beginning of this painting. I finally got around to finishing the painting this week. 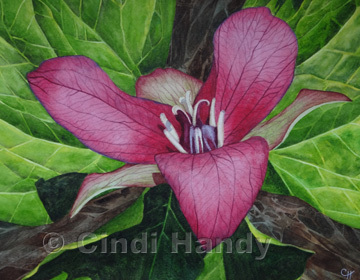 Trillium is based on a photograph of a Red Trillium flower that I found in the woods behind my house. This entry was posted in Flowers and tagged flowers, Southern Saratoga Artists' Society, watercolor. Bookmark the permalink.